The US just grabbed back the crown from China with the AI-focused Summit. The Department of Energy pulled back the curtain on the world's most powerful supercomputer Friday. 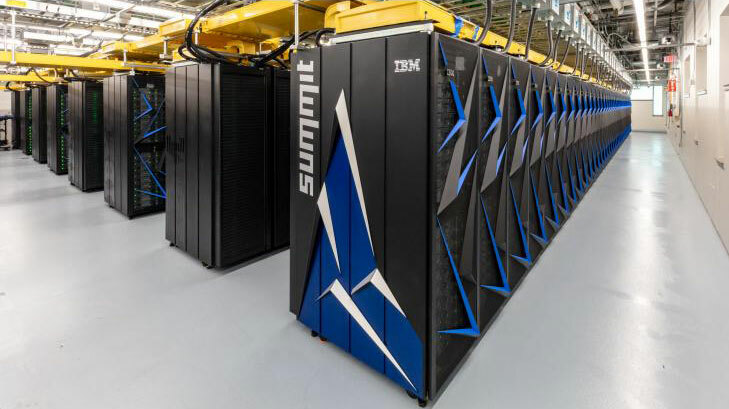 When Summit is operating at max capacity, it can run at 200 petaflops -- that's 200 quadrillion calculations per second. That smokes the previous record holder, China's Sunway TaihuLight (which has a 93 petaflop capacity). Summit is also about seven times faster than Titan, the previous US record holder which is housed at the same Oak Ridge National Lab in Tennessee. For perspective, in one hour, Summit can solve a problem that it would take a desktop computer 30 years to crack. There's a lot more to Summit than simply snatching back a record China's held for five years. It was designed for artificial intelligence operations, and can use machine learning and deep learning to power research into health, physics and climate modeling, among other domains. Scientists have already used Summit to run what they say is the first exascale scientific calculation. That's one billion billion calculations per second (or one exaop). Summit almost doubled that, as it ran at 1.88 exaops to analyze millions of genomes; the supercomputer can hit 3.3 exaops using mixed precision calculations. The US is aiming to build a fully capable exascale computing ecosystem for research by 2021, and Summit is a step towards that. Upcoming projects include analyzing exploding stars (or supernovas) to find out how elements like gold moved through the universe, and running simulations on new types of materials such as superconductors. Scientists also plan to look for relationships between cancer factors like genes, biological markers and environment by crunching vast reams of health data. Researchers will use Summit's power to probe other disease markers, such as for Alzheimer's, heart disease and addiction. "Summit is enabling a whole new range of science that was simply not possible before it arrived," Oak Ridge computational biologist Dan Jacobson said in a release. There's a battle between not only the US and China, but Europe, Japan and other nations to build better supercomputers. The machines aren't just focused on health and environmental research; supercomputers are used for aircraft design and developing nuclear weapons too, so there's a lot at stake.